Now that the warmer weather is here and school is out, my mind wanders to slower summer days, spent relaxing with family and friends and leisurely pursuing hobbies and so, the June Chameleon Hat was inspired and aptly named – Gone Fishin’. In keeping with my basic Chameleon Hat, this one has the half double crochet crown, and shelled band, but it is designed for a looser fit and squared off top, with a roping around the band and, of course, a couple of little fish because they are just darned cute! I think it’s still cute without the fish and makes a pretty nice classic sunhat as well. 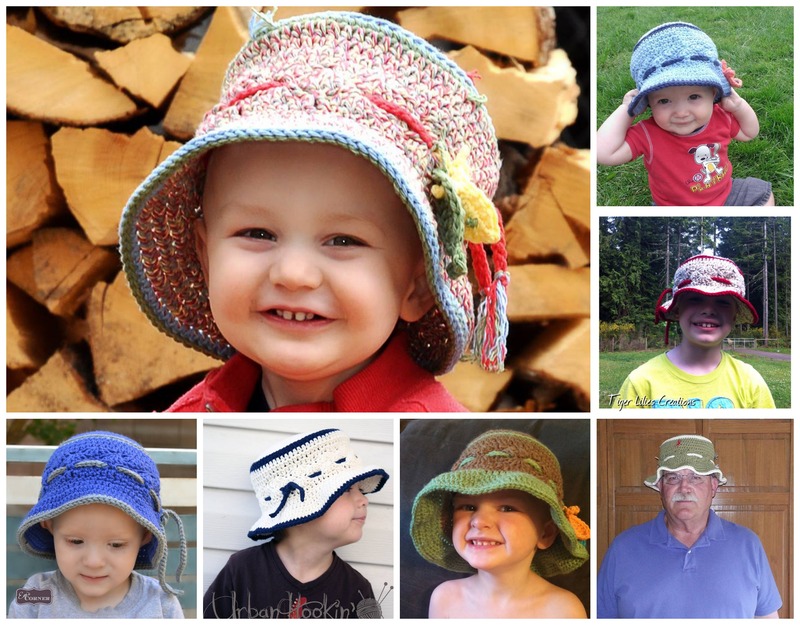 There are so many different ways to personalize your hat……. Rnd 2: Ch3 (counts as dc), [sc in center of next Shell, Shell in next sc] repeat around, ending with 4 dc in beg st, join to top of beg ch3, sl st into next sc. Rnd 2: Ch1, starting in same st [sc 3 sts, 2sc in next st], repeat to end (after last full repeat, sc remaining sts to end), join. Rnd 3: Ch1, starting in same st [sc 4 sts, 2sc in next st], repeat to end (after last full repeat, sc remaining sts to end), join. Rnd 4: Ch1, starting in same st, sc in each st to end, join. Border: Join CC, ch1, starting in same st, work sc in each st around, join. Fasten off. Now turn the hat so the inside is facing you, join CC and work sl st in each sc, join. Fasten off. Band Cord: Chain long enough to go around the hat band and allow for tie and hang, sl st in 2nd ch from hook and each remaining ch to end. Fasten off. Weave cord evenly through last shell row of band. Ch14, sl st in 5th st from hook, ch4, sl st in same st, work one stitch in each chain as follows: sl st, sc, hdc, dc next 3, hdc, sc, sl st in last ch; working along opposite side of ch, sc, hdc, dc next 3, hdc, sc, sl st, pull yarn through to wrong side and fasten off leaving a long enough strand to tie or sew in place. Glue eye in place or to avoid choking risk, embroider the eye. Thanks so much ..just want I was looking for ..going to make for a Christmas gift..
what does[ sc 3 sts, 2scin the next st] do you do a single crochet in the next three stitches and then 2sc in the next stitch? I am a little confused on the brim section, it says repeat to end (after last full repeat, sc remaining sts to end). Is it repeated until the end of the round or how many times is it repeated until you sc to the end? Hi there, it means that if you don’t have enough stitches left to do a full repeat, just sc the last few stitches. Click the blue download button, not the print friendly button. I love the hat but you only gave it in new born to 3 mo. I would like to have it in an adult size. I’m not good at adjusting sizes of patterns. Thanks. Typically for a free pattern a full range of sizes is not provided, however, I do provide the full range in the download at the bottom of the pattern as noted. Just click on the blue download button. Love the pattern. However, you don’t explain what the ‘shell’ stitch is. I am an advanced crocheter, so I know what you mean, but others not as advanced will not. says 5 double crochets in the same stitch…. Hi, & thankyou for the wonderful pattern. Love it! I have made one of these for my grandson, (he has outgrown it already!) & have had many inquiries on it. I just wondered if it is ok to sell these if I link back to you? I love to crochet & I make & sell a lot of items, but unfortunately I do not have the patience to attempt creating my own patterns yet! I rely on the generosity of others who don’t mind if I sell my work. I didn’t notice it mentioned if it was allowed. Please let me know! Either way…love your patterns! Thanks! Yes, Michelle, you can certainly sell the finished products and I always appreciate a link back to my page for pattern credit. Just please don’t sell any part of the pattern or use my pictures. Thanks! I cannot seem to print out this pattern. Whaqt am I doing wrong? Hi there Elaine, I’m sorry you are having trouble. I don’t know what may be wrong. You should be able to download the pattern by clicking on the “download here” button at the bottom of the post and from there you will be able to print the PDF. Hope that helps. Great sun hat. The fish are adorable. This had it adorable!! We recently had twin great-grandbabies (they are almost 4 months old now); a boy and a girl. These would be awesome for them to keep the sun out of their eyes. Thank you for sharing your work.